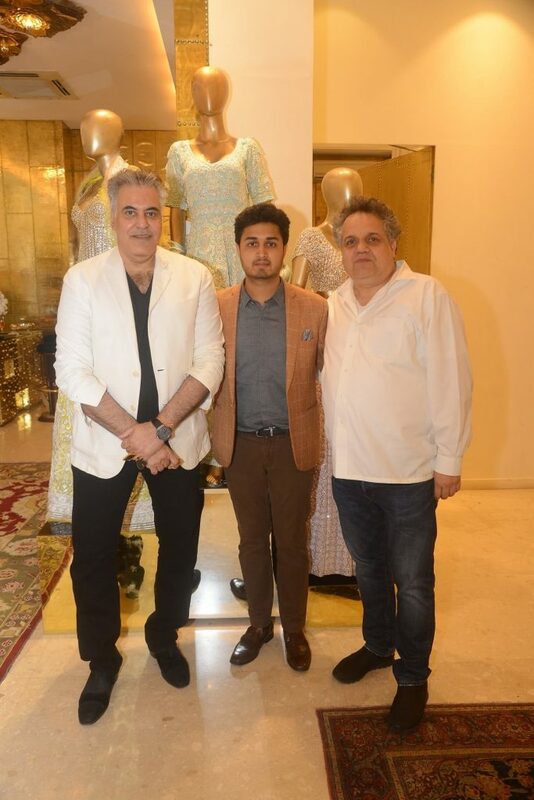 The country’s most coveted couturiers, Abu Jani Sandeep Khosla, have always believed in setting the trends rather following them. 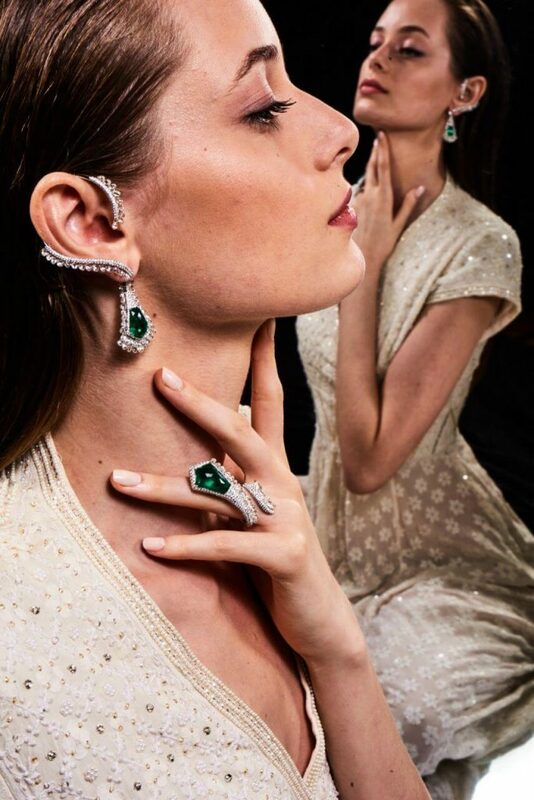 They now give us the lowdown on what SS 19 holds for jewellery as they unveil their new collection of jewels with Saboo renowned as a leading global player creating masterpieces in the world of jewels throughout a 7-decade long legacy. Over the years Saboo has pushed the boundaries in terms of materials used, techniques employed and above all the calibre of craftsmanship which makes every piece a coveted treasure. ‘This is a meeting of our creative vision and Saboo’s expertise and craftsmanship. The result is absolute fantasy brought to life’, said Abu and Sandeep. Here is a glimpse shared by the designers you would be glad that you did not miss. It is a teardrop-inspired motif, a swirl at its peak point. Persia witnessed its birth. It was brought to India by the Mughals and has since become iconic in textiles, weaves and embroideries. Kashmir’s coveted shawls have it as a central feature. It is our iconic motif for 2019 and features extensively in our jewellery ranges. The standout pieces are our oversized rose-cut earrings and pearl danglers. We are in love with the seduction and sheer style of the bold and dramatic and our paisley jewellery is an expression of that passion. Rose cutting a diamond is a technique which was first used in the 15th century. And became hugely popular in the Victorian era. We love it and have chosen to reinvent it for the 21st. The many facets resemble the unfurling of petals on a rose. The cut oozes warmth and unique transparency. Saboo has taken precision to a new level when it comes to cutting and every piece truly is Fire in Ice. The old-world charm of luminescent rose cut diamonds finds a brand-new expression in this thoroughly contemporary collection which boasts cutting edge design. Absolute Glamour is the mood as the artists’ imagination soars. Paisleys, art deco and floral motifs dance together to craft mesmerizing and unparalleled radiance. The mission was to create pieces where the diamonds seem to sit on air. 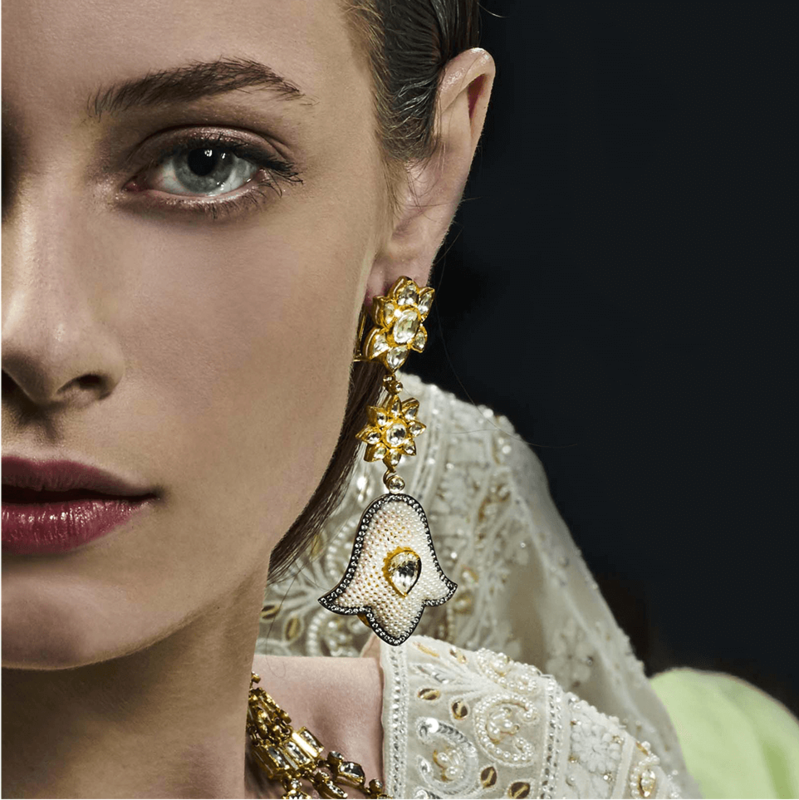 Saboo’s artisans worked to this exacting brief and the gold setting is barely visible, making every piece a masterpiece. PEARLS ARE MEANT FOR SO MUCH MORE THAN A STRING. We have an eternal love affair with white. Inspired by our 25-year Romance with Chikankari, we developed the first few pieces of this collection. Saboo is masters at the technique of weaving pearls and this range leverages that expertise. Pearls are sublime. Their delicacy is unmatched. But so is their impact. Style is a Whisper. And that Whisper speaks loudest. When Love is spun into the most delicate web of natural pearls, The NEW White Whisper Collection is born. Drawing its inspiration from the delicacy of chikankari embroidery and it’s floral and geometric motifs this collection is a spectacularly refined expression of a unique craft. Ultimate Elegance at its most understated, it also has pieces which feature rubies and emeralds. Every piece has exquisitely bold enamel work on the inner/reverse side. This collection is deeply romantic. Our appetite for bejewelled beauty extends beyond the borders of jewellery. This collection pays homage to the divine and distinctly iconic objects, which are a part of our heritage and culture. These objects themselves have been created as jewels. From the ring box to puja or prayer objects like the Diya and lota, this collection pays homage to them. Saboo’s Enamel and Jadau work is exceptional and objects become a fine art. Fine Living is a passion and so is our need for spiritual beauty. Men should not be deprived of the precious. A watch is never enough. From buttons and cufflinks to brooches and rings, we intend to bring the bling for him in 2019. Om Chambers, August Kranthi Road, Kemps Corner, Near Kemps Corner Flyover, Mumbai.